This Martian “postcard” comes after NASA’s Mars Curiosity rover drilled its eighth hole on the Red Planet. This composite image looking toward the higher regions of Mount Sharp was taken on 9 September 2015. In the foreground — about 2 miles (3 kilometres) from the rover — is a long ridge teeming with hematite, an iron oxide. Click the image to see a full-size version without the postcard banner. Image credits: NASA/JPL-Caltech/MSSS. On Tuesday, 29 September, NASA’s Curiosity Mars rover drilled its eighth hole on Mars, and its fifth since reaching Mount Sharp one year ago. The drilling of the hole 2.6-inches (65 millimetres) deep in a rock the team labeled “Big Sky” is part of a multi-day, multi-step sequence that will result in the analysis of the Martian rock’s ingredients in the rover’s two onboard laboratories — the Chemistry and Mineralogy X-Ray diffractometer (CheMin) and the Sample Analysis at Mars (SAM) instrument suite. Curiosity is currently on the lower slopes of Mount Sharp in a region covered in sandstone called the Stimson Unit. Two weeks ago, still in the same general vicinity, Curiosity took a pair of long-range images toward higher regions of the mountain. In the foreground — about 2 miles (3 kilometres) from the rover — is a long ridge teeming with hematite, an iron oxide. Just beyond is an undulating plain rich in clay minerals. And just beyond that are a multitude of rounded buttes, all high in sulfate minerals. The changing mineralogy in these layers of Mount Sharp suggests a changing environment in early Mars, though all involve exposure to water billions of years ago. The Curiosity team hopes to be able to explore these diverse areas in the months and years ahead. Farther back in the image are striking, light-toned cliffs in rock that may have formed in drier times and now are heavily eroded by winds. 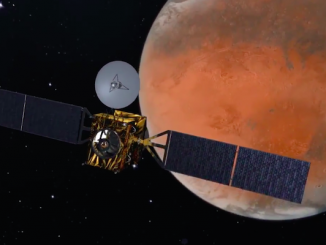 Officials expect to delay next year’s launch of a European Mars orbiter and lander about two months — from January to March — to remove faulty pressure transducers from the landing craft’s braking system, the European Space Agency announced Friday. 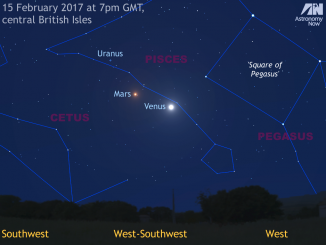 Currently setting over four hours after the Sun as seen from the heart of the UK and visible in the west-southwest at dusk, dazzling Venus is about to hit peak brightness in the constellation of Pisces. The planet attains magnitude -4.8 on Friday 17 February — some 21 times the luminosity of brightest star Sirius gracing the southeast horizon as darkness falls. 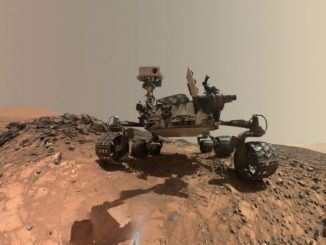 NASA’s Curiosity Mars rover has detected a wide range of organic compounds on the red planet along with signs of seasonal variations in background methane levels, a possible indicator of biological activity.